Sensei Avi Azoulay, Nana Dan (7th degree black belt) with AJKA-I, started training in 1972 in his native land of Israel and has trained under the guidance of top instructors such as Satoshi Miyazaki (JKA Belgium), Alex Sternberg, Ray Dalke, Milorad V. Sricevic MD., and currently draws from Sensei Safar and Sensei Otis vast knowledge and experience. In addition to practicing and studying Shotokan Karate, he studied Judo, Jiu Jitsu and Aikido that were offered in the same dojo in his hometown. In 1981, upon his honorable discharge from the IDF, He started teaching in his hometown and eventually had 2 clubs in Israel. In 1985, Sensei Avi moved to New York to further his knowledge and experience. While teaching in Queens, NY he enrolled in the LIU Instructor Program with Sensei Safar and Dr. Milorad Sricevic, to further his knowledge as well as propel his competition career. His passion and unique style of teaching encourages students to do the best they can and strive to better themselves. While teaching the technical and dynamic aspects of Shotokan Karate, he finds ways to make it fun for the little Samurai’s. As a competitor, he participated in numerous tournaments on a local, regional, national and international level. He has been on the USA Maccabiah team 3 times (1989 and 1993 World Maccabiah Games; 1991 Pan Am Maccabi Games) and its captain in 1993 to the world Maccabiah Games in Israel. Between 1985 and 1996 he participated in 14-15 tournaments per year, and 1996 he decided to devote most of his time to teaching and coaching students in the Dojo. Students in the dojo achieved local, national and international acclaims. Sensei, who has been a member of the American JKA since 1992, is also a member of the American JKA National Technical Committee. Sensei Avi is registered with the American JKA-International as an Instructor and examiner. He was also certified by the A.A.U. and Long Island University as an instructor and a coach. Kiran began training with Sensei Avi in July of 2002, after a 10 year hiatus from the martial arts. He has received his Sandan (3rd Degree black belt) in December of 2013. Kiran has been teaching various classes in the dojo, as well as being a part of the dojo competition team. Over the last few years, Kiran has participated in several local and national tournaments, including the AAU National Championships. Recently, he was selected to represent the USA at the AJKA-I Euro Cup in Budapest, Hungary. Kiran is currently studying at Stony Brook University, and in pursuit of a medical degree. He also enjoys running road races, and visiting the gym. Sempai Cliff started training in karate while in college, where he earned yellow belt. After a number of absences he started practicing again in the mid 1980’s with instructor Ronald Johnson. With his tutelage he earned up to Brown 3rd Kyu from the JKA East Coast Region signed by Chief Instructor Okazaki in 1988. Cliff started training with Sensei Avi Azoulay in May of 1996, about a year after his son, David, entered Sensei’s Children karate class. He earned my 2nd Kyu on Oct. 26, 1996 and have been training here ever since. Busy as a partner in an accounting firm, DDK & Company, Cliff finds the time to attend 2-3 classes a week. Way to go Cliff. Claire began her training with Sensei Avi in August of 2000 at the age of six. She received her Shodan at the age of 13 and Nidan in June of 2010 (2nd degree black belt). Claire has joined the Dojo Team and has competed in local, national and international tournaments. Claire was a member of the Junior AAU national team as well as the AJKA national team. Being the dojo Team Captain she has assisted the junior members to achieve their best results. Claire has aided in teaching various classes and continues to train while at college at Columbia University, where she is pursuing a degree in economics on a pre-law track. Dr. Benson Yeh started training Shotokan karate in 1982 under Sensei Alex Sternberg. In 1988, he trained for a year under Sensei David Johnston at Brandeis University. Dr. Yeh returned to New York and continued his training with Sensei Joseph Talerico and received his Shodan in 1991. 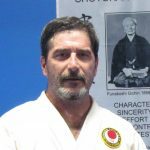 He competed in the 1990-1992 National USKF championships for both kata and kumite. In 1992, he started the Shotokan Karate club at the Albert Einstein College of Medicine and taught karate-do for 2 years, until 1994. After a hiatus from active training to earn his MD and board certification in Emergency Medicine, Dr. Yeh joined AJKA-NY, Syosset Martial Arts under Sensei Avi Azoulay in July, 2011 and received his Nidan in November, 2013. Dr. Yeh is an active student in the AJKA-I Instructor Training program and assist with classes as his schedule permits. David started his karate training under Sensei David Johnston (under Sensei Okazaki) in 1981 at Brandeis University, through graduation in 1984 achieving 2nd Kyu (brown belt). He continued his training in 1986 with Sensei Mori through December of 2006 and earning his Shodan in 1988. Moving to Long Island in 1996, making his training infrequent, he landed in our dojo in 2012. David started his professional career with Arthur Andersen in their consulting division in 1984. Later he joined PriceWaterhouseCoopers as a partner in their consulting division in 1998, which acquired by IBM in 2002. He is presently a partner with KPMG’s in their advisory practice focused on on Financial Services clients. David is married to Eileen and and has 2 daughters, Dana (works and lives in NYC) and Jessica (sophomore in Syracuse). David earned his Nidan in June, 2014. Richard, who came to our dojo as a brown belt, received his Shodan on July 25, 1997. He started his Martial Arts training about 40 years ago with Tang Soo Do and Hapkido, and later made the conversion to Shotokan. While building his business, Richard took a few years away from the dojo. He is back on deck and loving the sweating. He owns and operates Sani Wash since April 2000, a company that provides automatic soap injection systems for the hospitality, healthcare, food service establishments, and on-premise commercial laundries. He is currently working towards his Nidan (second degree black belt). Aside from Karate and work, Richard loves Archery, Guitar playing and song writing. Welcome back, Richard. Hi! My name is David Maldow, but they call me “Dudu” here at the Dojo. My martial arts journey began when I was 9 years old. My father, Cliff, who was already practicing karate and encouraged me to join the Syosset Martial Arts Center and Sensei Avi in Syosset. I recall jumping on my parent’s bed with excitement after my first class. Over the next several years, my passion for karate grew and several of my closest friends joined in on the fun. One of my greatest early memories was winning the gold medal in kata as an orange belt at a nearby tournament, with Sensei and Dad proudly watching on the sidelines. Karate has shaped my personality and temperament through discipline and self-confidence. I’ve developed many friendships along the way, both inside and outside the Dojo. Sensei encourages social events and even attended my Bar Mitzvah. Karate has also been a great father-son activity, and I will always cherish the strong relationship my father and I have grown through karate. The Dojo is a very family-friendly environment- one of the many reasons I enjoy practicing karate at Syosset Martial Arts Center. I have earned my Shodan on June 30, 2003. I grew up in Jericho and attended Johns Hopkins University as an undergraduate. I recently completed medical school and am in the process of applying for residency in Radiology (with the hopes of returning to New York to complete my training). Pierre started his martial arts practicing judo at the age of 5, in France. He achieved his Black Belt and was highly decorated while being a member of the French team. Pierre came to USA with his wife, Laurence, in 1990. Having two daughters, and wanted to give them the gift of martial Arts, he looked for a dojo for years. He landed in our Dojo in 2000, and enrolled Claire and Julie in the children karate classes. About 3 years later Pierre decided to give karate a chance, and started practicing Shotokan Karate and has been training with Sensei Avi Azoulay for past 11 years. Pierre earned his Shodan in June, 2014. Outside of his Karate life, Pierre has been a Wall Street executive for past 20 years with various top companies and currently serving as the Executive Director and Chief Development Officer for JPMorgan Chase. Ari started training Shotokan Karate at the age of 5. About a year later Ari joined the Dojo team and started competing in local/regional tournaments. In 2010 Ari participated in the AAU National Championships and earned a Silver medal in Kata and Kumite. He has been very active in the dojo, assisting Sensei with the kids classes and dojo events, birthday parties and more. He continues to compete in tournaments locally and regionally, and assisting with the dojo team as well. Ari achieved his Junior Black Belt June 22, 2016. At the moment Ari is working towards improving his skills in Karate and as an Assistant Instructor. In addition to karate Ari is loves tennis and has been playing / training on a weekly basis for the past 5 years. In June of 2018, Ari was tested and received his Jr. Nidan and currently is enrolled and taking a part in the AJKA Instructor Training Program. In 2008, while still supporting his son and the team, he officially joined the Dojo as a student and has been training since that time, attaining his Shodan in September 2018. Barry has worked in the Internet Security industry for over 25 years as a Systems Engineer and is currently with Symantec Corporation. He is married to Donna and has 2 children, Eric and Samantha.